There’s a feeling sometimes that every comic book has to make staggering changes, especially if it’s the last issue in a series arc. Daredevil #4 is not one of those issues. It wraps up the current story line involving The Shroud and The Owl in a way that makes those characters changed for the future, but the end of the issue is somewhat muted. Still, it’s a strong issue that caps off an entertaining first arc of Daredevil’s adventures in San Francisco. The issue begins with Matt Murdock in a bad situation. At the end of Daredevil #3, he was double-crossed by The Shroud, who had made an agreement with Murdock to try to take down the crime kingpin of the west coast, Murdock’s longtime adversary, Leland Owlsley (a.k.a. The Owl). However, when The Owl told The Shroud he could find his lost lover, Julia Carpenter (who was at one point Spider-Woman and later Arachne), The Shroud sided with The Owl, and Murdock was about to descend in a pit of fire. Thankfully, The Shroud hadn’t totally betrayed Murdock. He tosses Murdock his Daredevil extending cane, which allows the agile Murdock all he needs to escape, and then The Shroud darkens the room in shadows, giving Murdock the advantage over The Owl’s thugs, while also fleeing with The Owl. Subsequently, Murdock (now as Daredevil) must track down The Shroud and The Owl before they take some experimental communications technology. Daredevil accomplishes his mission… mostly. He stops The Shroud and promises that he will help him find Julia. The Shroud begrudgingly accepts his help. Meanwhile, The Owl has absorbed experimental photon technology. It seems to have taken over his body, which allows Daredevil to capture him and turn Owlsley over to the police. However, when they find The Owl his eyes are full of light. Something significant has happened to The Owl, and I expect that this will play an important role in upcoming issues of Daredevil. The art done by Chris Samnee is again outstanding, but I also want to give some attention to the work done by colorist Javier Rodriguez. There is a strong theme of light and shadow in this issue. The Shroud operates in shadows (it’s his power to control them) and The Owl pursues photon tech that essentially fills his body with light. Along with fitting the light/dark choices that have troubled The Shroud, the visual color contrast between these light and dark elements is really well handled by Rodriguez in this issue. It’s also great to see a recent change in the credits to Daredevil. There is no writing credit in the start of this issue. It simply lists Mark Waid and Chris Samnee as storytellers (with coloring credit to Rodriguez and lettering to Joe Caramanga). The chemistry between writer and artists in mainstream comic books is also a little mysterious to outsiders, dating back to Stan Lee’s “Marvel Method” with Jack Kirby, Steven Ditko, and others. Illustrators are often making very importantly “writing choices,” even if they never compose a line of narration or dialog. I assume that Waid and Samnee have a very collaborative relationship, which makes the “storytellers” designation make sense. Daredevil #4 sets a new course for The Owl, making him potentially much more powerful in the future. It also seems to hint that The Shroud will return to this series in the future, along with possibly Julia Carpenter. 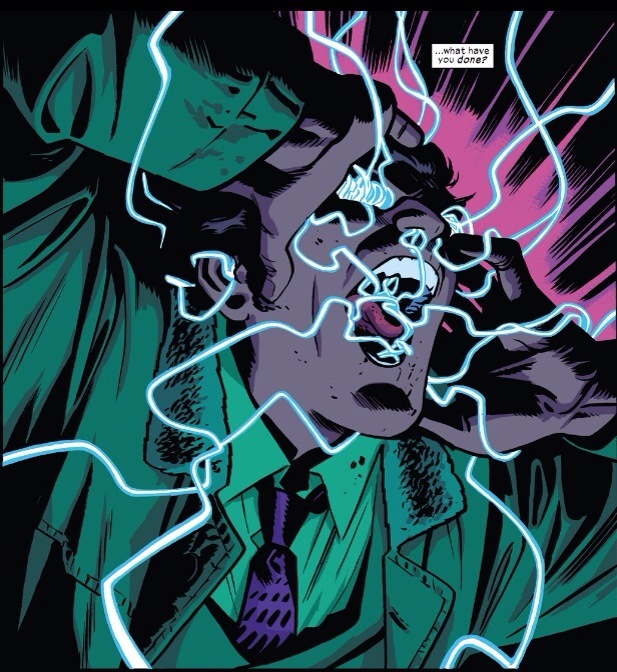 Matt Murdock manages to make things mostly right, and has demonstrates a strong working partnership with Kirsten McDuffie, along with their romantic connection. Overall, the latest issue of Daredevil is another in a long line of winners by Waid and Samnee.